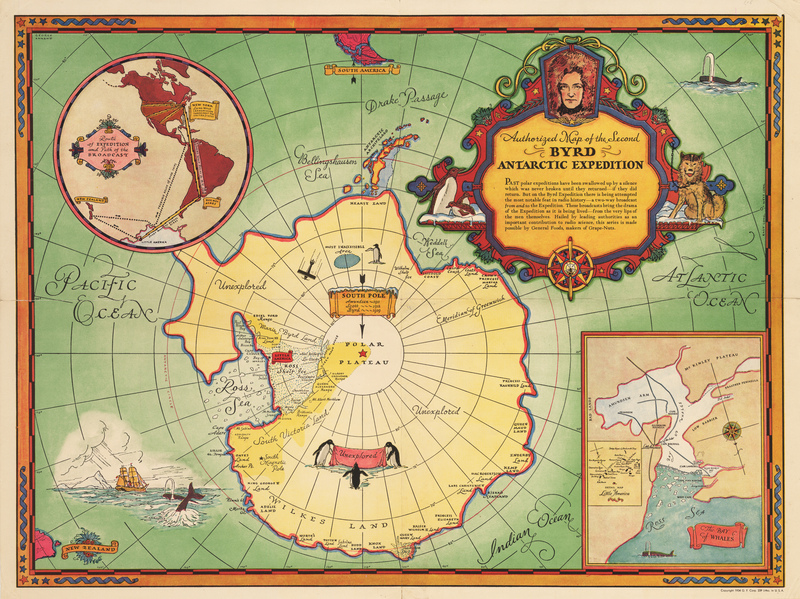 This brightly colored pictorial map was published by General Foods at the time the Byrd Expedition was attempting what the maps calls ‘… the most notable feat in radio history – a two-way broadcast to and from the Expedition. These broadcasts bring the drama of the Expedition as it is being lived – from the very lips of the men themselves’. The entire continent of Antarctica is at the center of the map, and is labeled with details such as were known at the time, with vast areas of the continent still unexplored and labeled as such. Physical features of Antarctica which had been named by that time are present, primarily along the coast and the Ross Sea. Penguins hold a banner reading ‘unexplored’ in their beaks in one place, and the colorful cartouche features a portrait of Byrd himself. Spouting whales decorate the map as does a lovely frigate plying the waters at full sail. An inset map in the lower right quadrant of The Bay of Whales depicts the Ross Sea and important topographical features of that area, and inside the inset is yet a smaller map of ‘Little America’. The other inset depicts the ‘Route of the Expedition and Path of the Broadcast’. A banner near the NE coast of the USA depicts ‘Longwave Transmission throughout the United States’. The map is a colorful relic of the early days of corporate funding of radio broadcasting. The project by General Foods not only followed the expedition, but also served as an advertising venue for the company at the very advent of this type of joint project in the USA. Condition: This marvelous pictorial map is in A condition.